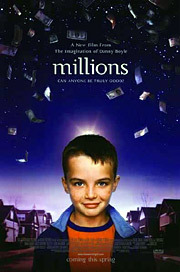 Over the weekend Sarah and I got a chance to catch a free screening of the movie Millions. I had seen the preview on the Garden State DVD and thought it looked like an interesting story. The movie follows two Brittish brothers as they try to decide what to do with the “millions” of brittish pounds they stumbled across days after moving to a new town. A couple of twists are thrown in to complicate things — including the fact that the Brits are in the process of making the switch to Euros which coincidentally makes the boy’s newly acquired fortune worthless in a few short weeks. We definitely recommend checking it out . It’s cute without being overly sugarcoated. It brings up some moral questions without being preachy. It’s an original story that will make you put yourself in the boy’s shoes.